Coopworth ewe just before shearing & lambing! The Coopworth is a medium sized, dual-purpose, white faced sheep with an alert but quiet disposition. It was developed in New Zealand in the 1950's and 60's for the purpose of improving fertility and ease of management over the commonly bred Border Leicester and Romney breeds. A professor, Dr. I.E. 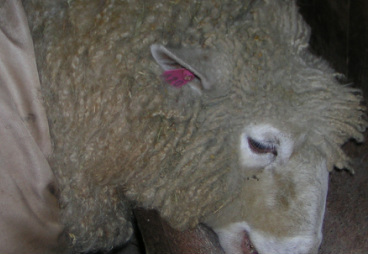 Coop simply wanted to improve the reproductive preformance of the Romney, which dominated the New Zealand Sheep Industry. 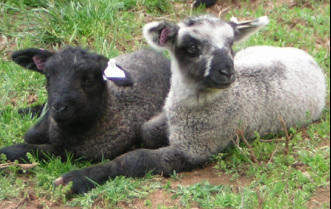 Border Leicester rams were bred to Romney Ewes and the offspring were selected on individual performance, resulting in a ewe that easily lambs twins or triplets and raises them unassisted. The Coopworth lamb is vigorous at birth and fattens on grass and mother's milk. 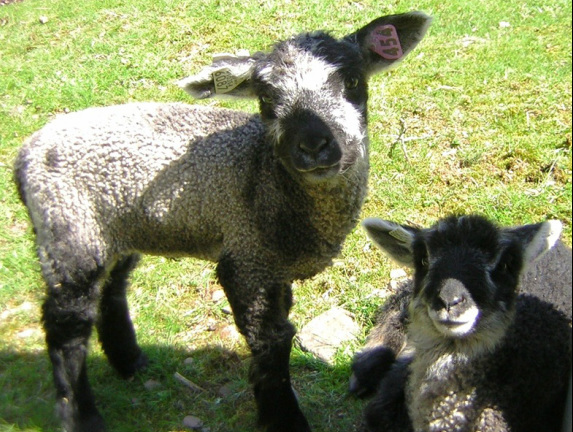 The Coopworth breed has grown to become the second most numerous breed in New Zealand. Coopworth were first imported to the USA in the early 70's. When I chose the breed as my primary breed around 2003, it was still considered to be a rare breed in the USA. However, the breed is now known by most fiber customers and the wool is considered to be in demand, not only for it's bright luster and beautiful crimp but it is easy to spin - with a staple length of 6-8 inches. Coopworth wool is excellent for the beginner spinner, it almost spins itself! Some of my customers prefer to "spin in the grease" with Coopworth. My sheep wear coats/covers most of the year, so the raw fleece is very clean and free of vegetation matter compared to the fleece of sheep that do not wear coats/covers. production of both meat and wool. The meat is very lean and does not have the "gamey"
this on the USDA meat page. Colors available in fiber: White, black, gray (silver) and "blue"
"Starter Flocks!" - each will be priced based on the number of ewes w/1 ram. ​ Call or email for pictures and details of a "starter flock", I will be happy to help. A 50% deposit is needed to hold any sheep & if we transport, a fee will be added based on distance & health certificates or "meds" that may be needed to cross state lines.